Makaela Marie, Isaac Timothy, and Jacquelin Cecilia: At the Zoo! Makaela is so interested in bugs including spiders, but she will only look, not touch, and she'll FREAK-out if as much as a ladybug gets on her. Poor kid. 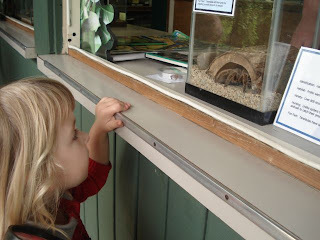 Here she looks at a tarantula at the insect section of the zoo. I have a feeling she'll eventually get over her fear and be one of those kids who has snakes and spiders for pets.